There's been a bit of regression going on here lately. I know that changes are tough on little kids, especially, so it's not exactly surprising to see- even five months out- that they are struggling to adapt to the arrival of the newest family member. However, it can get a bit frustrating for me. I also find it a bit odd that it's taken so long to manifest, because for the most part, I haven't seen much going on until very recently. Michael's always been a cuddle-bug, but he's stepped up the clinginess quite a bit in past weeks, and I can't really blame it on teething any longer. Abby's been doing just wonderfully with forks and spoons, but has waited until now to spurn them. She's also started baby-talking, though I can see that the timing of it has to do with Michael's current forays into vocal communication. It seems that, rather than it being a regression on her part (because she's still speaking just fine the vast majority of the time) it's her attempt to make sense of the differences in the way that she and her brother speak. She starts it up at the dinner table, when Michael makes his attempt to ask for more milk; she mimics him, rather than utilizing the diction she is so capable of. Though we've made no changes to our dinner routine (with some rare exceptions) throughout the course of our time as a family, dinner time does seem to be the place where all of the anxiety works its way out. The biggest issue we've been running into with Michael since it came time for him to be fed in a chair is his terrible lack of patience with confinement. Most nights, we're lucky if we get ten minutes of peace before he's throwing food, cups, plates, and utensils around, and clamoring to be released. Several months ago, we moved him from high chair to booster seat in the hopes that he'd be happier seated around the table with us. However, we immediately found that we could not put him directly at the table without real chaos ensuing (Must. Grab. All the things! 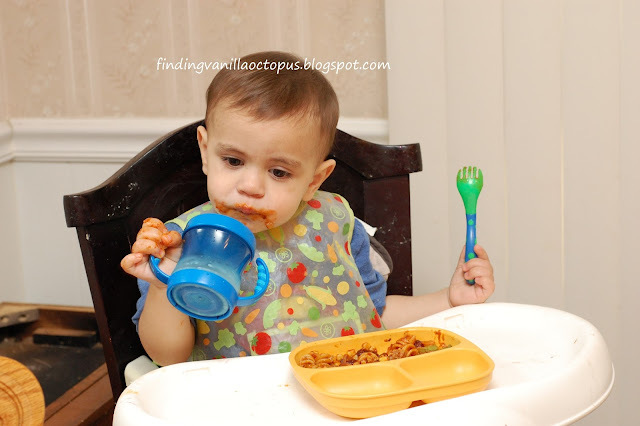 ), so he's effectively remained in a high chair- just lower to the ground. He seemed to be happy with the transition, and the chair and booster took up less space, so we went with it. The booster, however, has a tray that requires force, rather than latch release, to be removed, and Michael has learned that he can simply rip it off. This he did- several times- this morning, when he awoke so miserable and congested that he refused to eat, let alone sit in his chair. When we gave him a sippy of milk to drink, he gulped it, then allowed the liquid pour straight back out of his mouth as he let out a long, mournful wail. I took him out of his wet onesie and brought him into a long, warm, mucous-loosening shower with me. Though still cranky, his mood was markedly improved for the rest of the day. We did still encounter issues at lunchtime, so I finally just switched out the booster for the high chair. There's no easily removing the tray on that thing; even Tom and I struggle with it on occasion. He actually seemed to like the new old seat. I suppose the higher vantage point was novel after all this time. And, unlike his sister- for the few minutes that he dedicates to getting the job done- he's still using a fork to eat with. I've got to count the wins wherever I can, right?